Aquaterra Energy, a global offshore engineering solutions provider, has designed, fabricated and installed a new Sea Swift platform for PICO Petroleum Integrated Services, the lead contractor for Amal Petroleum Company’s (AMAPETCO) Amal field in the Gulf of Suez, offshore Egypt. This will open new opportunities for future cooperation between the two entities in large projects both in Egypt and the Middle East. 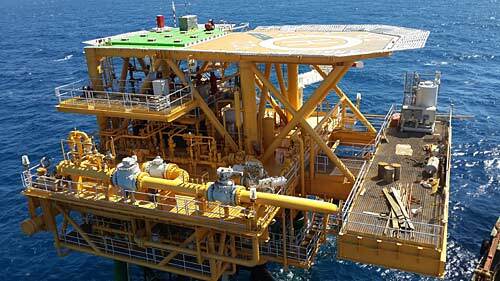 The Sea Swift is a Conductor Supported Platform (CSP) and is installed in 23 metres water depth. It included a 385-tonne topside featuring a helideck and emergency accommodation with provision for six wells. The new topsides facility for the Amal-C platform involved designing process, piping, electrical, instrumentation, control system and technical safety scopes of work, the project also included the design of the new subsea production pipelines to the Amal-A platform. The project, which took 18 months from design to installation, involved building a bridge link to the neighbouring Amal-B platform and reconfiguring the topside pipework to create a new and improved production profile.